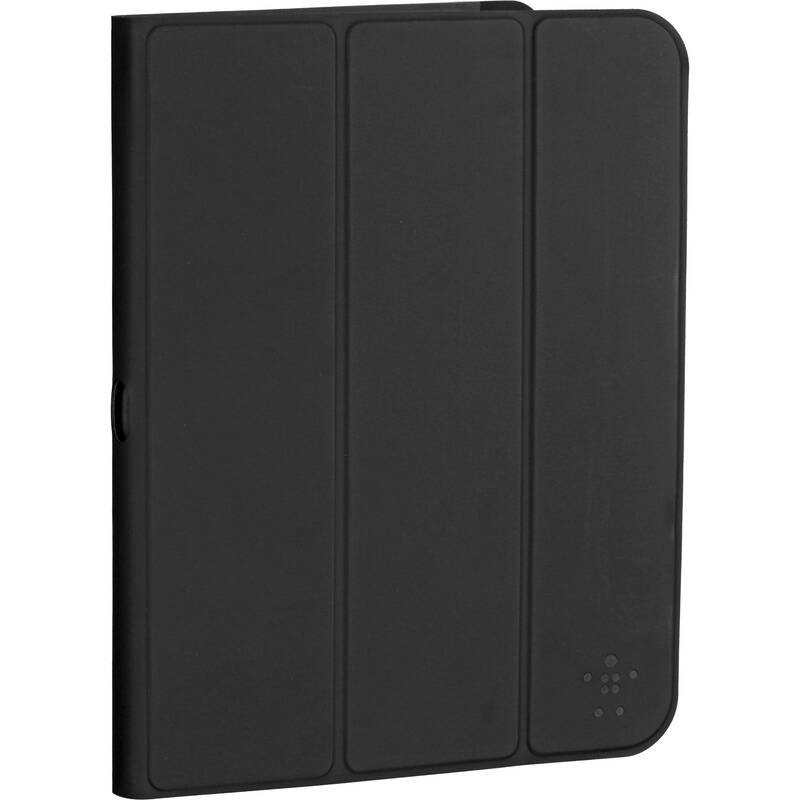 Whether watching YouTube, surfing the Net, or messaging pals, the black Universal 10" Cover from Belkin will help keep your iPad Air, Galaxy Tab, Galaxy Tab 3&4, Galaxy Note, or Galaxy Tab Pro safe from dings, bangs, scuffs and bumps. This slim, lightweight cover folds into a stand for upright viewing. This upright position is suitable for watching movies and related activities where you aren't constantly interacting with your tablet's touchscreen. The cover may also be folded into an inclined orientation so you can comfortably type. For mobile handheld use, simply fold the cover behind the tablet, and you're good to go. To reveal the camera lens for shooting photos and video, simply fold-down flap. A magnetic closure provides a secure seal and allows for instant access to your tablet. Your tablet is secured in the polyurethane Universal 10" Cover by two rounded corners on the bottom, and two top clips with an elastic band to maintain proper tension. The micro suede inner lining helps to ensure that your tablet's screen is protected from scratches when inside this case.